Daily Prayer - Simply stated. Do it. Frame your day in prayer. Don't know where to begin? Begin with a Morning offering. Don't forget about any devotions or novenas you might be doing or that you can start. Also recommended is a 15 minute period of silent prayer (yeah I know but the world is very noise and God seems to speak to us in the silence of our heart. Why not give our heart a hand and turn off the TV, cell phone, radio, iPod, and computer to better focus?) Don't forget an evening prayer to end your day too. I wish, my Lord, to receive You with the purity, humility, and devotion with which Your most holy Mother received You, with the spirit and fervor of the saints. And although I am not able to receive You in the Eucharist, I ask that You be with me as You are in the Eucharist. I ask this through the Immaculate Heart of Mary and in Your name. Amen. Think of the mass as food for your soul and the sacramentals and the vitamins that help nourish your soul so that the food you eat is processed at a supperior capacity. Study the Faith - At all times be ready to give an explanation for your belief, Says Saint Paul in his letters. Face it. Most of us are going to have children to whom we will need to pass on our faith. It is extremely helpful to know what it is you are going to be passing on to your children. After all, if you don't know Algebra then there is no way you can hand on algebraic knowledge to your children. It is likewise with the faith. Plus, with the way the media has a tendency to misrepresent the Catholic position and teachings on that position, you can't really count on them to do this for you. Also, it would be nice if you could explain to your child that the reason the Catholic Church does not let women be priest is not because the Church is a He Man Woman Hater Club. Finally, if you have the luck as I do, you will often encounter liberal Hollywood types in the bars and pubs while they are in town filming a movie while they are watching the USC game at the same pub or bar that you are in while watching the Notre Dame game. It is comical to watch a person who knows little about the Catholic faith attack the faith that they know nothing about and then are forced to back peddel in order to try and save fact instead of admitting that they have no idea about that which they speak. Don't know where to begin doing this. Start with some of the basic Apologetic Books on the faith. You can get some real beginners like "Did Adam and Eve have Belly Buttons" to something more philosophical such as Kreeft's "Handbook of Christian Apologetics." Beyond all the apologetics stuff and want more 'serious' theology? 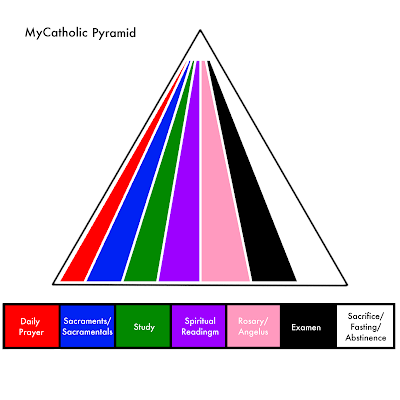 Try the Catechism of the Catholic Church. If you are beyond that, then hit up some of the primary sources: church documents, encyclicals, and theologians. Many are on the web and can be found with a quick web search. Spiritual Reading - Only a fool would ignore the wisdom of those who have already walked your path. So why not learn from them and read the wisdom that they received from the Holy Spirit? The great thing is that many of the spiritual classics can be found on the web: Imitation of Christ, Introduction to the Devout Life, Confessions, Secrets of the Rosary, etc. DON'T FORGET SCRIPTURE! Yes, I know we are Catholic, but that doesn't mean you don't have to read the Bible. So take it down from the top shelf in your closet, dust it off, open it up and start reading. You will be amazed what actually is and is not in scripture. You will also be amazed at what people think is in scripture and in reality isn't (no where in scripture does it say "God helps those who help themselves.") Open the holy book and learn what else it doesn't say. The Rosary and Angelus - Ooooo. Two 'Marian' things. Yes, but Marian devotion is intrinsic to the Christian life. Remember, the Rosary is primarily a meditation on the life of Christ. It is also a pray asking Mary to intercede for us. Also, Mary isn't dead. She is in Heaven with the other saints. Our God is the God of the Living and not the God of the Dead. Praying the Rosary can take as much time as you see fit. Though if done efficiently it can be done in 15 minutes (that is 1% of your entire day. It take you longer than that to brew and drink that 4th cup of coffee you drak today). If you have trouble staying focused try praying along with an audio rosary. The Angelus is a brief midday prayer in which the pray-er remembers Mary's Fiat (That means 'yes' in some old language and does not refer to the car she drove.) and her role in salvation history. It is also a brief meditation on the Incarnation, which is really what it is about, as every Marian doctrine is focused on revealing and emphasizing the glory of God. Fasting/Abstinence/Penance/Sacrifice - Christ Himself said that there are some demons that can only be driven out through fasting. Doing these things help train the body. Train the body, train the mind, train the soul. It really is futile to try to train your soul without trying to train your body. However, training your body is also futile if you are not doing it for the love of Christ. Christians have also believed that there is a redemptive quality in all forms of suffering. So when you take on an a voluntary act of suffering via Fasting/Abstinence/Penance/Sacrifice it only becomes more fruitful as you are willingly accepting it instead of just finding yourself standing in the muck of pain and only offering it up because you have nothing else to do. A Daily Examen - Most people refer to this and the daily "examine of conscience". A true examen isn't just looking at your conscience and what you did good and bad, where you loved God and where you failed to Love God through your day. An examen like that can surely make a person depressed. However, the Examen in the Ignatian tradition is a "brief review of your day recalling events and taking note of your feelings, emotions, thoughts and actions in how God is present in your life and the time when the Holy Spirit was drawing you toward life." Don't know how to do an examen? Go here for a guided audio examen/review of your day. Piramid is very good idea but strips should be horizontal and shouldn't have equal proportions (IMO). Which should be the biggest strip? I don't know, yet. What a great article about nutrition, this is really what I am looking for. Thanks! "It's one of a kind!" So don't break it! FREE Donuts from Krispy Kreme!